The transfer to a UK hospital may pose legal problems, as procedures for ‘ending life’ in cases where there is no more chance of recovery is problematic in the UK – as we know of a recent case of a man that sought help for ending his life that had no future – and the formal refusal of a British court to allow ‘euthanasia’ in his case. The Netherlands does have a more liberal law in this sense. There are hardly any examples of people in PVS that regain consciousness, and even less that have any chance to function again as a human. Younger people stand statistically a bit more chance than middle age people like Prince Friso. In most cases ‘economics’ (the extreme high costs of keeping someone in such a permanent vegetative state) form the decisive argument for halting such treatment in a specialised medical ward. In the case of the Royal House of the Netherlands the financial means are not a problem, but this affluence creates an ethical problem. Now how does the Dutch Prince who is kept in permanent coma in a British private hospital, fits in this discussion? We have now witnessed a state of exemption since the avalanche accident in Austria this winter of half a year. However sad it is, also royals should come to a decision, that may be harder to take because of their wealth. 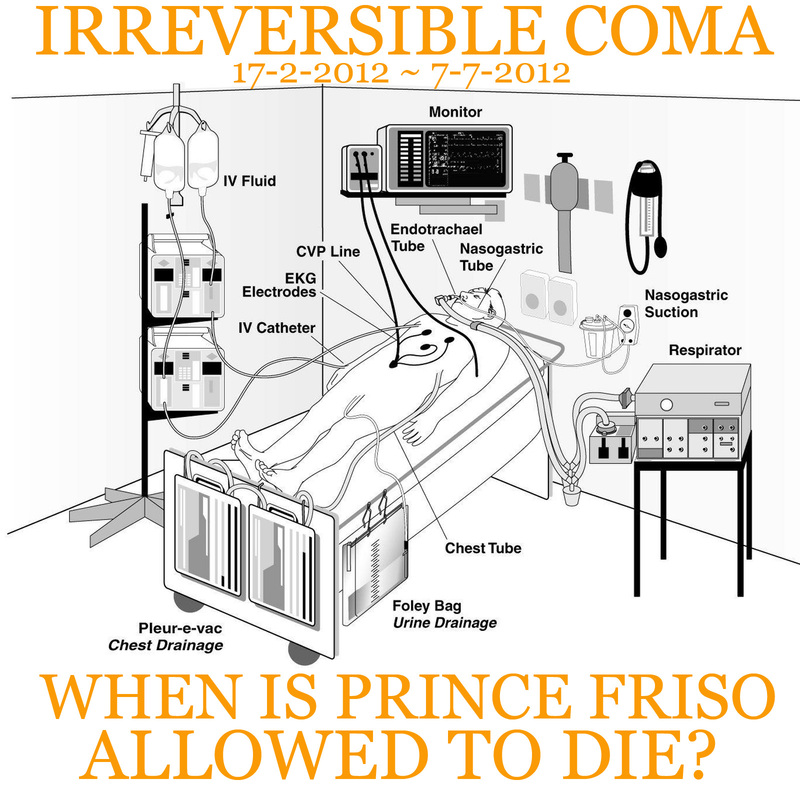 The bereavement process of the family must have been frustrated and one wonders why the wife of Prince Friso has not had the courage to, or has been kept from, ending this ‘high tech’ medical ordeal. 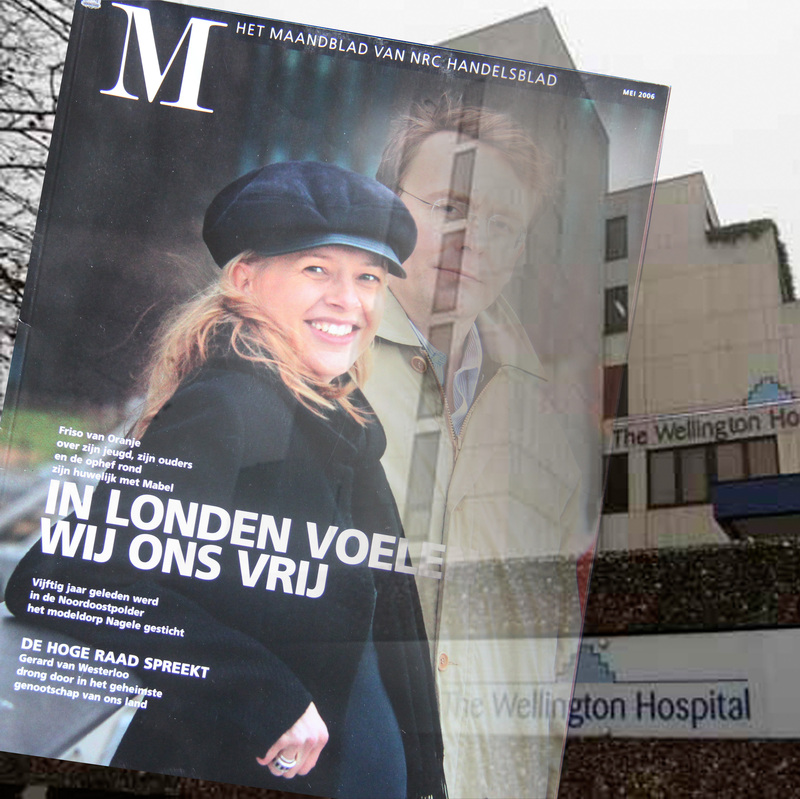 Interview and photographs of Prince Friso and his wife Mabel and they way they enjoy London as the place were they work and live in the M magazine of Dutch daily NRC/Handelsblad May 2006. I did fade the Prince into an image of the brain surgery specialised Wellington Hospital where he is kept in coma now. One hopes that Dutch Queen Beatrix who is used to control family affairs with an iron hand, will come to see that her hand is not the hand of God when she orders to pull the plugs out. It is time – also for a prince – to die. 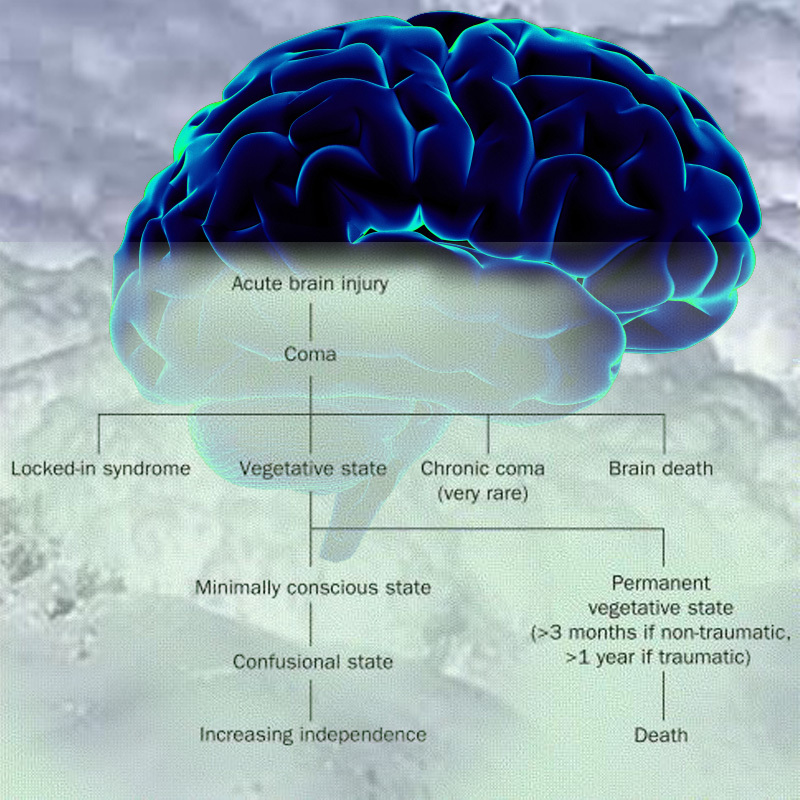 (2) “Unlike brain death, persistent vegetative state (PVS) is not recognized by statute as death in any legal system. In the US and UK, courts have required petitions before termination of life support that demonstrate that any recovery of cognitive functions above a vegetative state is assessed as impossible by authoritative medical opinion. (4) Radio Netherlands Worldwide 24/8/2012: An influential Dutch ethicist (Heleen Dupuis, former professor in medical ethics at the University of Leiden) has said that if Queen Beatrix’s son, Prince Johan Friso, had been hospitalised in the Netherlands after his ski accident, doctors would have already stopped his treatment.